Pikmin hails from a time when Nintendo was, and I don’t mean to sound like I’m the first person to make this argument, more willing to take a risk. The GameCube was out, with its weirdly designed but still marginally industry-standard controller, and they took some gambles on new properties, like Luigi’s Mansion, Animal Crossing, and, yes, Pikmin. People who said Nintendo hadn’t been interesting since they defined 3D games on the N64 just weren’t looking hard enough. Pikmin has always impressed me, from its weirdness to its relative mechanical complexity and sharp visual style. I don’t mean to say Pikmin 3 is a bad game, because it’s not. It just doesn’t belong, not in this year, not with these controllers, and not on this console. 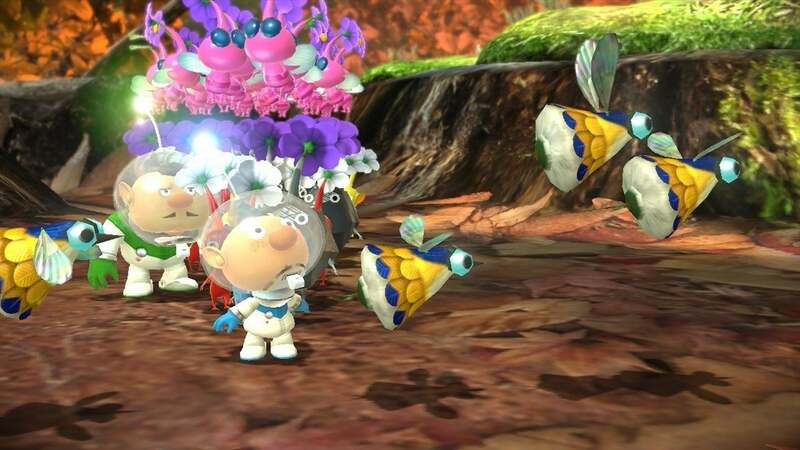 Whether it’s a failing of design or the architecture surrounding it is hard to parse, but one thing’s for sure: Pikmin 3 is a troublingly unsatisfying experience. The basic premise is the same (you crash land on a foreign planet, and become supreme leader of the Pikmin), but with a couple twists. You’re no longer looking for ship parts, but fruit, the likes of which will hopefully provide sustenance to the people starving back on your home planet. Some old Pikmin variants return, and new ones appear, from the fire-resistant Red Pikmin to the water-loving Blue. You also find and control three characters this time around: Alph, Brittany, and Captain Charlie. This adds veracity to Miyamoto’s claim that Pikmin 3 is about “cooking,” the idea being that all three characters need to be in use at once, splitting your work load effectively in a plate-spinning act. It’s an admirable design philosophy, and one that should make use of the game’s mechanics in an engaging way. Either Nintendo didn’t quite get a handle on the concept, or they were deathly afraid of alienating players, because the distinction between playing a Pikmin game with one protagonist versus three is dispiritingly minimal. Let me elucidate the “puzzle” surrounding their use; is there a small ledge in front of you? Throw some Pikmin and one of the leaders up there. Are there two platforms bordering a river, one with an arrow pointing across it, and the other with a giant ‘X’ in the arrow’s line of sight? Yeah. It could be argued that maximum efficiency is only possible with complex use of each character, which I’m sure is true, but I honestly don’t know why anyone would need to be that frantic. For a game based around survival, I never felt especially threatened. Each day spent exploring eats up one ration of fruit, and I’d assume exhausting the supply would result in a game over screen. I wouldn’t know. By the end of the game, I’d accumulated over 20 days worth of fruit juice. Even a late-game scenario that strips you of your safety net is tremendously easy to rebound from. That pervasive simplicity does a disservice to Pikmin 3’s potential gameplay depth. What worked in the earlier games still works, but it’s rather egregious to have an experience so similar two console generations and nine years later. Even when modern Nintendo has only visited a unique concept twice, they find a way to make it tiresome and expected. The final level of the game is actually almost entirely what I would’ve liked from the whole game: tense, challenging, and requiring smart squad management. Distanced from my academic appreciation of its design, the whole thing is pretty frustrating, solely because the game makes no attempt to prepare you for the difficulty spike. Or, if it does, the job’s sorely unfinished. In fact, almost all of Pikmin 3’s flirtations with challenge come from an artificial place. Boss battles are routinely the worst part of the game, and they can stretch on for in-game days at a time. Their visual design is, like the whole game, pretty stellar, and most of them are actually pretty conceptually strong. The biggest issue, with both these sequences and the entirety of the game, lies in control. Back when I reviewed New Super Mario Bros. U, I devoted a little time to speak to the severe miscalculation in its multiplayer. The GamePad was unusable for anything but a throwaway “Boost Mode,” meaning that to have an authentic co-op experience, you needed at least two Wii Remotes. It was an affront. Not just because of its practical applications (remember when Super Mario World was a launch game, but you needed an NES controller to play it? No? ), but because of what it signaled to me about the Wii U. I had a feeling that no one really knew what they were doing with this thing. So here we are, almost a year out from launch, and still no one really knows what to do with this thing. You can use the GamePad to play Pikmin 3, as I did for about two-thirds of the 12 hours I spent with it. It is a decidedly poor experience. The second screen is used for, get this, a map, as well as a data log reader. The left thumbstick moves your adorable hero, and the adorable army follows him. The right thumbstick rotates the camera. The aiming reticule is also moved with the left thumbstick. If you want any sort of finesse, you need to stand still and move the stick just slightly enough so that the reticle goes but the character doesn’t, like some sort of sick twist on Resident Evil-style tank controls. Here’s the difference: you can’t aim so hard in RE4 that Leon Kennedy runs forward into danger. Then you connect a Wii Remote and Nunchuck, and it’s fine. The increase in playability is most evident when you acknowledge Pikmin 3 for what it really is: an RTS-lite. And in that regard, the relative mouse pointer-esque fluidity of a Wii Remote so greatly outshines the alternative that I’m pretty sure I need to throw up in my mouth a little. It definitely isn’t this terrible, but in spirit, playing with the GamePad feels akin to playing Starcraft with an N64 controller. As depressing as I find the whole situation, the revelation does make Pikmin 3 easier to recommend — provided, of course, that you have a Wii Remote handy. The only thing you lose is the direct camera control, but the game does a pretty good job with that on its own, and there is a snap-to-center button. It begs the question of why they didn’t just map the reticule to the right thumbstick on the GamePad, but, hey, I don’t make games. If you can get past that barrier, and I found it to be a sizable one, then there’s a pretty charming game at Pikmin 3’s core. I think it looks really great, even if the ground textures are garbage up close, and no one can take away the seedy thrill I get from sending my seedling slaves to kill a giant monster, or lift a wonderfully dated cell phone. The Pikmin types are all reasonably interesting, though a couple are underused. I like a lot of Pikmin 3, almost in spite of myself, because Nintendo has designed the framework to a much, much better game. It’s relaxing when it should be nerve-wracking, and calm when it should be frantic. Not to say those emotions aren’t viable and engaging, but they feel born accidentally. Pikmin should be like Metroid: a more mature experience from Nintendo, that challenges without becoming obtuse or unfair. These systems are so smart that misusing them results in a minimal amount of enjoyment, but that amount is still enough to carry it through 10-12 hours of gameplay. It’s one of the better reasons to own a Wii U, I’d suppose, but I don’t see this as a huge draw for those still unsold on the console (you shouldn’t be sold, for the record). You could get either of the first two games, which are naturally smaller in ambition, but more fitted to match that scope. For people, like me, who bought in early and can’t believe a year’s nearly passed, Pikmin 3 could serve as a single drop of water in this drought. I just wish it weren’t flawed in ways so inexorably and tragically linked to its console, its controller, and its developer, as if asking for a good game on the Wii U is like striking a deal with an especially vindictive and cynical genie. And I never want to have to use a goddamned Wii Remote ever again. I couldn’t disagree with your assessment more. I’ve found Pikmin 3 to be a refreshing delight- the ambient atmosphere, the gameplay-rich progression, the brain-meshing puzzles… This game is Nintendo at its finest, and every minute I’ve spent playing this game is a minute of my life I DON’T feel was wasted. You said a game like this doesn’t belong in the current times, with the controllers and tech we have now. That it’s “egregious” to have a similar experience to the previous entries 9 years later. That ignorance there takes the cake. Do you mean to tell me that just because the vast majority of the great sea of shooters are a certain way, that games like Pikmin shouldn’t exist? That because games nowadays are solely based on focus groups, cutscenes and graphics, that gameplay-rich, true quality games should be part of a bygone era? That simply because Pikmin 1 and 2 were on the Gamecube, there’s no room for a Pikmin 3 in today’s world? And yes, OF COURSE the game is going to play like the first 2 and give you a similar experience. It’s called Pikmin 3, remember? The controls are SUPERB. The game is meant to be played with the Wiimote/Nunchuk, with the gamepad as a map/camera/control hub. You can use it so see the areas explored, and set destinations on the map- easily sending groups of your Pikmin to various destinations all automatically via the map screen. The reason for the Wiimote/Nunchuk as primary controls are because it offers a level of control that is unachievable with dual analogues. This is an example of the benefits of motion control, whether you want to admit that or not. Speaking of which, you’re seriously criticizing the Wii U’s ability to use Wiimote/Nunchuk? You mocked NSMB-U, saying that “now you need 2 Wiimotes to play the multiplayer.” You’d need 2 controllers for multiplayer REGARDLESS, at least with the Wiimotes you’re not buying new peripherals! 1 out of ever 70 people ON THE PLANET own a Wii, so chances are this is saving the consumer money. Chances are, you already had a couple Wiimotes before buying a Wii U. And this is a SERIOUS PLUS for the system. The majority of games are designed to be used with not 1, not 2, but THREE separate controllers- Gamepad, Pro Controller, or Wiimote/Nunchuk, user’s choice. Variety is a GOOD thing, not bad. Games like Pikmin 3 are the only reason I’m still gaming in this day and age. Yes, times have changed, but that doesn’t mean that fun experiences have to. Platformers entertained me in the 80s. Does that mean they have no place in today’s day and age? I’d beg to differ, seeing as the New Super Mario Bros series has sold over 10 million copies, DKC Returns sold 5 million copies, and 3D platformers have done even better. Pikmin 3 is timeless. It’s a game that works, no matter what day and age we’re in, and the fact it adheres to the previous entries’ formulae is a GOOD thing- it’s the whole reason I bought it! Some people just think all games should be like Call of Duty or Assassin’s Creed, and declare anything which doesn’t conform to the “standards” of today’s multi-million dollar multiplats as inferior. If you seriously think I’m asking every game to be like Call of Duty or Assassin’s Creed then… well, you clearly have spent no time on this site, and somehow even less time listening to my opinions on games. And I’d elaborate on contesting all of your points, but I’m talking into a void, since you’re probably never coming back here to read what I have to say. Oh well.